Kagura unlocks the storeroom to let Shizuma take the Mist Blades. 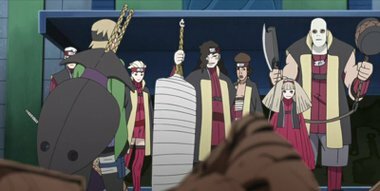 The New Seven Ninja Swordsmen begin an insurrection, the end goal being to turn their village back into the Blood Mist Village! News of the rebellion reaches Chojuro and Mei, the current and previous Mizukage. They are determined to execute the perpetrators, along with Kagura, who aided them. In order to change Chojuro's mind, Boruto makes an astonishing announcement. S01E30 - The Sharingan VS The Lighting Blade, Kiba The Fang!